Every day’s great at your Junes. 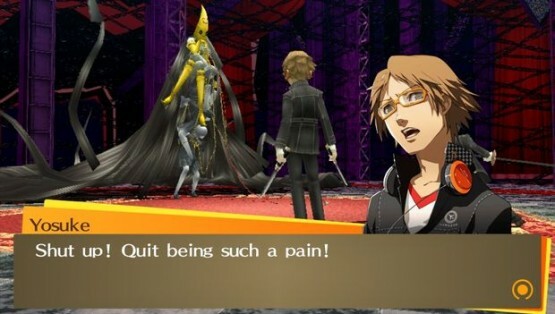 You’ll hear that a lot when you play Persona 4 Golden. But is it, really? Your parents leave you in a tiny little country town for a year, you’re thrown into a new house, a new school, an extended family you barely know — oh, and people are dying. How is this great? Surprisingly enough, this was my first time delving into a Persona game. I am a huge fan of RPGs, including JRPGs, but Persona had not yet made it into my collection. Let me put it this way. Whether or not you have played a Persona game before, Persona 4 Golden is a game that will make you want to buy a Vita. If you don’t have a Vita, stop what you are doing. You’re in the emergency room with a gunshot wound? You’ll probably survive long enough to make it to the store and back. Go out and buy yourself a Vita, and get this game. You’ll have plenty of time to play it while you recover from surgery. Seriously, this isn’t just my favorite Vita game thus far, it’s my favorite game on any system this year. For those of you like me who had never played a Persona game, or didn’t play the original PS2 release, Persona 4 puts you in the skinny jeans of a Japanese high school student. Your character has transferred for the year while your parents are away, leaving you with your uncle and his daughter in the small country town of Inaba. Rather than finding yourself stuck in a sleepy country town for a year, you find yourself in the middle of a murder mystery and in true Scooby Doo fashion, the only way to solve the mystery is with you and some of your fellow high school students. Ruh ro! Persona 4 Golden is a very carefully balanced fusion of traditional turn-based RPG, social sim and murder mystery. The social sim aspect delves deeper into the characters you will interact with. You don’t just bump into someone and suddenly you’re the best of friends ready to put your lives on the line for each other. As you spend time with each character you go much farther into their own stories, so Persona 4 Golden is as much about learning about the other characters as it is uncovering the main mystery. But there really is a very careful balance there. I didn’t ever feel like I was spending too much time just talking to people, and I didn’t feel like I was spending too much time exploring and fighting. 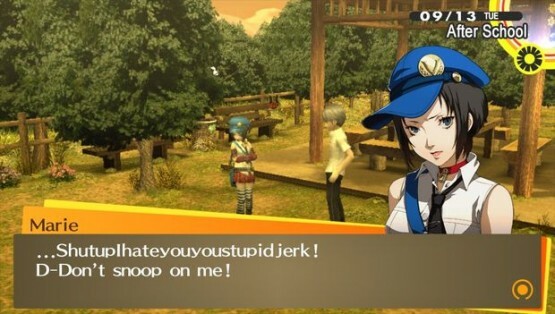 Persona 4 Golden places a strong emphasis on communicating and strengthening relationships with other people, and growing your character as a person. Don’t spend all of your time fighting monsters in the dungeons, to be at your best you can’t ignore any aspects of the game, or life in general. Spend time with your friends, and strengthen your relationships with them. Join a sports club or an arts club, or both. Get a job. Read a book. Study. Challenge yourself to eat a giant bowl of food. All of these things help your character to grow, and you are rewarded with increased attributes. The Social Links that you cultivate help your friends, who eventually are able to join you in your battles, to be more effective. Don’t worry, it’s not all about talking and feelings. You still get to kill stuff. I won’t go too deeply into how you get there, as you’ll find that for yourself, but eventually you will be able to explore an alternate world where you will have to battle monsters. 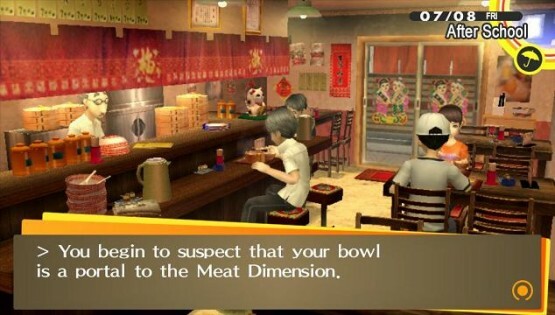 Persona 4 Golden is a pretty traditional turn-based RPG in that respect. You will have some gear and various attributes that determine how well you do in combat. As you earn more experience, you will be able to take on harder dungeons that you will gain access to as the game progresses. You will be able to summon Personas to help you in battle. There are a bunch of different Personas that you will be able to collect as you go, each with their own sets of skills to aid you in battle. You can merge these Personas together to make even more powerful personas. For players of the original game, this is the same as before but with a few new categories of Persona. Given that this is ultimately a port of a PS2 game, the natural question to ask is whether people who DID play the PS2 version of the game will want to come back for more. Golden brings a lot more to the table. The original Persona 4 had periods of the calendar that were unplayable. In Golden, these time periods are playable and there are new things to do. There are two new Social Links, and associated set of Personas to collect, new animations, new costumes, new weapons and more voiced dialogue. There is also a new TV channel feature with a bunch of audio and video content from the Persona series to enjoy. There is a lot of new stuff here for returning players to enjoy. Also, since the Vita has integrated networking support, a new Voice feature was added that lets you find out what other players did each day. If you are having trouble deciding how to spend your time, this is a great way to get some ideas. Just tap the on-screen Voice button while you’re connected to either Wi-Fi or via 3G and you will get a screen full of other players’ itineraries for that day. Can’t decide whether to head to Junes and do some dungeon exploring, or to go to soccer practice? Ask the collective P4G hive mind. When you are in a dungeon there is a similar feature that lets you ask for help from other players. I haven’t had a chance to try this out since the game isn’t officially out yet and nobody is playing, but if you are having troubles getting through a dungeon, give this a try. Now, if I had to gripe about one thing it would be the visuals. This is a PS2 port, so there are places where it would be nice to have had some higher resolution textures in the dungeons for the Vita. Outside of the dungeons things look much better thanks to the awesome art style. Don’t let that deter you, the game still looks and feels great. Load times are short and the game runs GREAT on the Vita. If you have a small memory card though, you may want to consider the physical copy of the game. The digital version is over 3GB. My 16GB memory card is bulging at the seams. My game collection is feeling neglected since I started working on this Persona 4 Golden review; and it doesn’t look that is going to change anytime soon. With so much content in such a tiny package, P4G will keep me occupied for months trying to nail down every possible ending and effectively complete the game to a 100%. With that in mind, it’s time for me to dive back into the Midnight Hour. 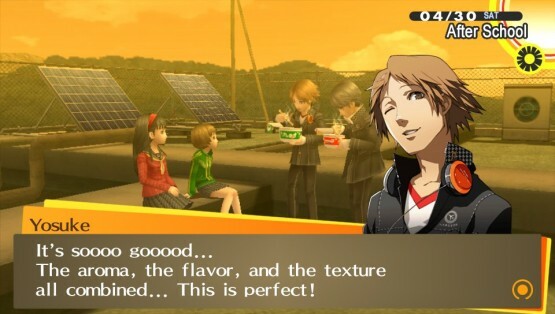 Do yourself a favor and go out to pick up Persona 4 Golden right now, you won’t regret it.